What's the Soulmate Quiz on Facebook About? What’s the Soulmate Quiz on Facebook About? Internet quizzes are nothing new. Many a time, I have completed quizzes telling me what Marvel superhero I would be based on my responses, as well as my “mental age” from the answers I gave. These are harmless time wasters, of course, but there’s no denying the fact that they gain attention. This has been true for the recent Soulmate Quiz, which has surfaced across many Facebook feed. What exactly is this Soulmate Quiz all about, though? Soulmate Quiz, in its most basic form, is a type of program that matches you up with any Facebook friend you have. It compiles data on your Facebook page and spits it out in order to create a shareable result. Even though it’s an interesting concept, it seems like the results have been somewhat erratic. Mashable columnist Brian Koerber, for instance, was matched up with his mother the first time he tried Soulmate Quiz. What’s even stranger is that, even after a couple of additional attempts, his result didn’t change. 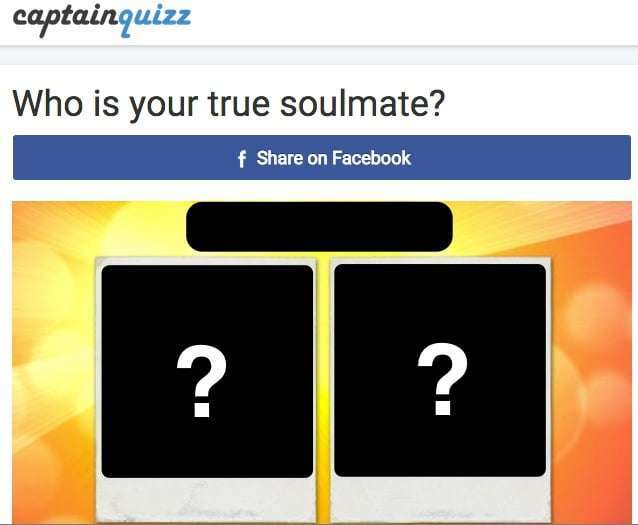 Based on this news, it doesn’t appear as though Soulmate Quiz has the ability to compartmentalize family members from others in a Facebook user’s friend list. It’s not like Koerber is the only unique case, either. One of my friends tried the Soulmate Quiz, only to have a good chuckle when he was paired off with his uncle. He took it in his stride, as I’m sure many would with a program like this, but it’s easy to wonder how responses would be from others. After all, everyone treats social media and Internet quizzes in general with varying levels of weight. What really piqued my attention, more than the aforementioned article, was the idea that Soulmate Quiz could be a security risk. Snopes put forth an article about this, stating that the quiz’s sudden burst of popularity came with its own warning signs. Fortunately, these claims were unable to be verified, not only due to a lack of evidence but the high reputation of Captain Quizz, the company behind Soulmate Quiz. In short, if you take this quiz, it’s unlikely that you’ll put your Facebook account in any real danger. Ultimately – and I am sure that others will agree – you can only rely on Internet quiz results so much. It’s fun to receive them and share them on various social media channels, since this can create laughs amongst friends and family members alike. However, everyone from regular social media users to owners of online marketing firms will agree that they are only so accurate. If you do not share a particular message numerous times, you won’t receive bad luck. If you fail to receive a high score on an extensive quiz, it does not say anything about your character. More than anything else, they are designed to be momentary diversions, and I believe that Soulmate Quiz is no exception. What do you think of Soulmate Quiz? If you are a Facebook user, have you received an odd or humorous result? Please leave your thoughts below! See also: 11 Things You Need To Stop Doing On Facebook Now!